Timing Advance in GSM, base station, mobile station, time sequence, transmission delay, Transmission delay is unavoidable in the radio interface. Transmission delay is unavoidable in the radio interface. If the mobile station moves away from the base station during a call, the further distance the more delay. The uplink is as the same. 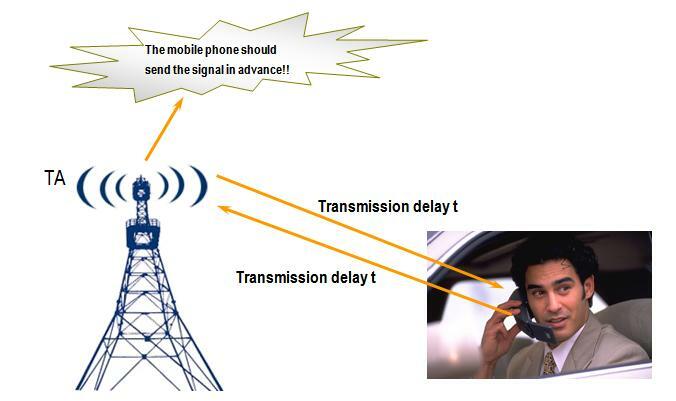 If the delay is too high, the timeslots of the signal from a certain mobile station and that of the next signal from another mobile station received by the base station will overlap each other, thus causing inter-code interference. According to the above description, the distance corresponding to 1bit period is 554m. Influenced by the multi-path propagation and MS synchronization precision, the TA error may reach up to about 3bit (1.6km). When the MS is in idle mode, the time sequence within the MS can be adjusted via the SCH channel. However, the mobile station does not know how far it is away from the base station. If the distance between the MS and the base station is 30km, the time sequence of the MS will be 100μs slower than that of the base station. When the mobile phone sends its first RACH signal, it is already 100μs later. For there is still another 100μs of transmission delay, when the signal reaches the base station, the total delay is 200μs . It is very possible that the signal collides with the pulse of the adjacent timeslot around the base station. Therefore, RACH and some other channel access pulses will be shorter than other pulses. Only after receiving the time sequence adjustment signal (TA) from the base station, MS can send pulses of normal length. In this case, the MS needs to send signals by 200μs in advance. 26 queries in 0.476 seconds.